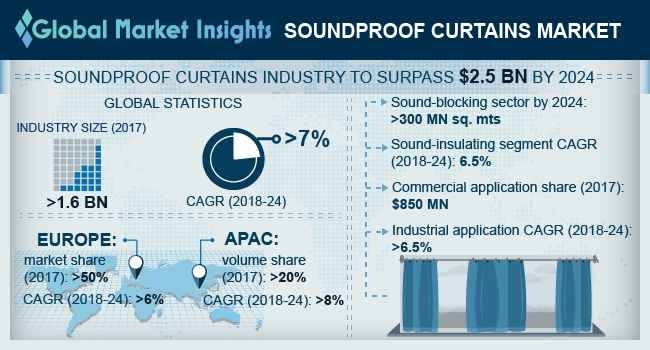 Soundproof Curtains Market size is estimated to surpass USD 2.5 billion by 2024; according to a new research report by Global Market Insights, Inc.
Increasing construction in commercial sector including hotels, hospitals, and educational institutes will drive soundproof curtain market size from 2018 to 2024. Stringent government norms, rising noise pollution and increasing health awareness are the key drivers for soundproof curtains industry. Rising real estate demand and infrastructural projects will enhance the product demand. Higher investment in residential sector owing to population inflation will drive the product demand. Strict government regulations including new environmental policies implementation regarding noise pollution will boost industry growth. In addition, increasing noise pollution awareness and its impacts will augment soundproof curtains market share from 2018 to 2024. Fiberglass soundproof curtains industy will surpass 550 million square meters by 2024. Key aspects including, ease of installation, low cost and high R value are likely to propel product demand across commercial sector. Rising tourism sector supported by government investments will drive product demand across new hotel chains. For instance, China’s tourism sector contributed over USD 1.35 trillion to its GDP in 2017. Strict government norms regrading noise pollution and industrial sector diversification will enhance the product penetration. Increasing sound pollution effect by expanding automotive domain, will also result in rapid product demand in the commercial sector. Upsurge in consumer spending and increasing awareness regarding noise pollution effects will drive soundproof curtains market growth in residential sector. Sound-insulating segment is expected to witness growth over 6% over the forecast period. Increasing investment across residential sector owing to rise in population level in Asia Pacific and Europe region will augment the soundproof curtains market size. Plastic foam accounted for over 35% revenue share in 2017 owing to its application in harder to fill areas, thus creating an airtight seal. R-value for plastic foam is higher than fiberglass and mineral wool, exhibiting an indication for plastic foam’s higher effectiveness. Superior properties including high strength, flexibility, and tear resistance compared to other counterparts are stimulating plastic foam soundproof curtains demand. Europe soundproof curtains market will witness CAGR over 6% up to 2024. Rising noise pollution due to expanding industrial and automotive sector will result in higher demand for soundproof curtains. In addition, necessity to accommodate tourist with increasing travel and tourism industry will further boost industry market share. For instance, Germany, UK, France and Spain have an established travel & tourism sector with a substantial contribution of 9.9% of the European GDP in 2016. Asia Pacific is expected to hold over 20% industry share in terms of volume in 2017. Emerging economies notably China, India and Thailand are expected to invest heavily in new infrastructure projects including educational institutes, hospitals and industries. For instance, the ‘Make in India’ Campaign is expected to boost the manufacturing sector in India creating a potential demand for soundproofing curtains. Indian Government also allocated USD 8.80 billion for infrastructure sector in 2018. Major industry players in soundproof curtains market are PES, Residential Acoustics, Rite-Hite, Robert Soper Limited, Sound Control Services, ZAK Acoustics, Acoustical Surfaces, Quiet Curtains, HOFA, GLT Products, Flexshield, Moondream, Acoustic Curtains, and Kinetic Noise Control. Other prominent domain players are Sound Seal, Steel Guard Safety Corporation, Lantal Textiles, Amcraft Manufacturing, Haining Duletai New Material, eNoise Control, SGF, Ecotone Systems Private Limited, Envirotech Systems Private Limited. Industry is expected to adopt merger & acquisition strategy along with a focus on product design for gaining competitive advantage.